For the most part, the case of Spanish immigration to Tampa, Florida follows the general trajectory of Spanish immigrants that we describe elsewhere. Spanish immigrants begin to arrive steadily to Tampa in the late nineteenth- and into the early twentieth-century, attracted primarily by the relocation to Tampa of cigar factories from Key West and Havana, Cuba, and by the employment opportunities generated by the tobacco industry. Tampa received Spaniards that were re-emigrating from Cuba, and eventually, immigrants who left Spain with Tampa as their destination. They tended to settle in two main enclaves, Ybor City and West Tampa, where they lived and worked among Cubans, and eventually Sicilians; there were also Germans –many involved in the graphic design end of cigar production (boxes, labels, rings, etc. )—and Jews –who were often small business owners. Like Spanish immigrants elsewhere, those in Tampa banded together in mutual aid societies, small and large, to provide for themselves the kind of safety net that was not available otherwise. The Centro Español was founded in 1891. By the time of the outbreak of the Spanish Civil War in 1936, the Spanish colony in Tampa was large and relatively united; the war galvanized the colony even further, and the mobilization efforts on behalf of the Republic were truly extraordinary. Like everywhere else, however, the height of cohesiveness and vibrancy of the Spanish colony of Tampa in the mid to late 1930s coincides with the beginning of what would be a rapid decline and dissolution of the colonia. The cigar business was in trouble since the late 20s, as cigar smoking was falling out of favor, and cigar –and most importantly, cigarette—production was being intensely mechanized. The other dissolving factors did their work as well; the realization that there was no going back to Spain, the relative prosperity and the reduced need to rely on community-generated social services in the post WW II period; these things, joined with the assimilation and mobility of the immigrants’ children and grandchildren contributed to the gradual dissolution of Spanish Tampa as a vibrant, organic community. The construction, in the 1960s, of an interstate highway right through the middle of what had been Ybor City, is an eloquent emblem of the forces that drove the dissolution of Tampa’s Spanish community. But if, in general terms, the history of the Spanish colony in Tampa follows the overall contours of other Spanish enclaves in the US, in many ways the case of Spanish Tampa is unique. The throngs of Spanish immigrants that began arriving to Tampa in 1886 did not have to insert themselves into a pre-existing economy and social order. 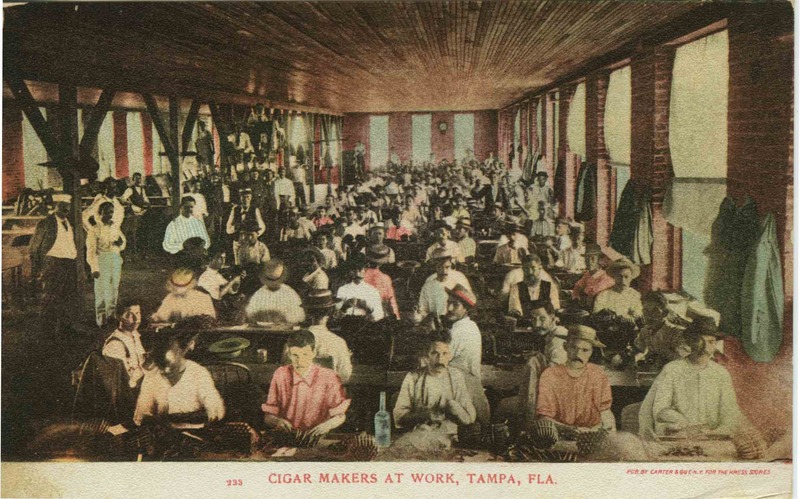 In significant ways, the arrival of cigar manufacturing coincides with –and in fact, is largely responsible for—the origin and development of Tampa as a modern city. This basic fact –immigrants in Tampa were, in important ways, founders of their own community— is the basis of Tampa’s uniqueness among Spanish enclaves. If Ellis Island is the point of entry for the vast majority of Spanish immigrants who will fan out to enclaves throughout the United States, in the case of tampeños we need to look elsewhere for the source. The history of Tampa’s Spanish colony is inextricably interwoven with the history and economy of the island of Cuba, from start to finish. Political unrest on the island is what spurred Spanish cigar makers to move their businesses to the US (first, Key West, then Tampa) in the 1860s and 70s; the 1962 embargo on Cuban exports –including tobacco— can be thought of as the symbolic endpoint of the story of Spanish Tampa. Although numerically there may have been, at certain points, more Spanish immigrants in New York than in Tampa, the concentrated nature of Tampa’s colonia –in and around the cigar trade, in and around either Ybor City or West Tampa—gave the community a gravity and a projection which were unprecedented. The fact that non-Spanish-speaking immigrants –Sicilians or Jews, for example—almost always learned Spanish in order to thrive in Tampa, is an illustration of how, in some ways, Spanish-language culture was not exactly a minority culture, at least within the limits of Ybor City and West Tampa. Tampa is also unique among Spanish-immigrant enclaves in the US because of the richness of its architectural heritage. Despite the ravages of decades of “urban renewal,” a significant portion of the colonia’s built environment has survived to this day. From the palatial social clubs and massive cigar factories to the sprawling cemeteries and humble casitas built for cigar factory workers, the city is full of these remnants of, and mute witnesses to, a vast and vibrant Spanish enclave of unprecedented scale. Centro Español de Tampa, Bodas de Oro. Reseña histórica de cincuenta años, 1891-1941 A scanned copy of this invaluable document that chronicles the history of Tampa’s oldest Spanish social club from the vantage point of its 50th anniversary. Courtesy of Antony Carreño. There was another wave, the one that occurred in 1931 when My Mother, my brother Juan and me arrived on January 11th at Port Tampa (not Port of Tampa). My late wife’s grandparents came to Tampa to work in the cigar factories after the fires in Key West. We originally came from Spain to Key West.